NO GLUTENS, NO WHEAT, NO CORN !!! Grain-Free Food is the safest choice. I consider NUTRITION to be the most important aspect of raising a healthy dog. In the wild, dogs search for meat and will sometimes chew on greens to help with digestion. As a rule, your dog will be healthier if his diet is primarily meat. I have found that GRAIN-FREE dry kibble is the best store-bought dog food available. We feed mostly fish formula dry food for best skin/coat health. We sometimes alternate beef and/or chicken if fish formula is unavailable. Treats are handy for training purposes but I caution the use of them unless all-natural, 100% MEAT. Anything man-made is artificial to the dog's system, and risks undoing your efforts to keep good nutrition a top priority. #1 Rule: No Glutens, No Wheat, No Corn. The best supplements I have found to date are fish oil soft-gels and shark cartilage capsules. I purchase these "human" supplements online and give for bone strength, joint lubrication and skin/coat health. This is a daily "treat" for our dogs. Once our dogs reach age 5yrs, we add Shark Cartilage as a daily supplement for quality of life. I cannot prove that shark cartilage stops cancer, but I do feel that it helps prevent and/or slow the process in older dogs. Both of these supplements are inexpensive and easy to find. ALL DOGS WILL CHEW, from puppyhood onward. Puppies are born with the chewing instinct to help shed "baby teeth." "Chew" Safety: Must be 100% Natural, preferably antlers. If giving your dog a "bone" please be sure it is not man-made. Try to purchase chews that are LARGER than your dog is able to carry in his mouth, to avoid choking and other injuries. CHLORHEXIDINE is a must-have item in our home. We use this gentle, medicated, NO-RINSE-REQUIRED bathing agent for indoor dogs; also used for wound care, kennel cleaning and more. It has a very pleasant scent, does not burn, and is very affordable! I purchase Chlorhexidine via Amazon (prime item) and also through www.revivalanimal.com. You may also find it in some pet supply stores and most horse/pet feed stores. Order straight from the manufacturer's website for best pricing! 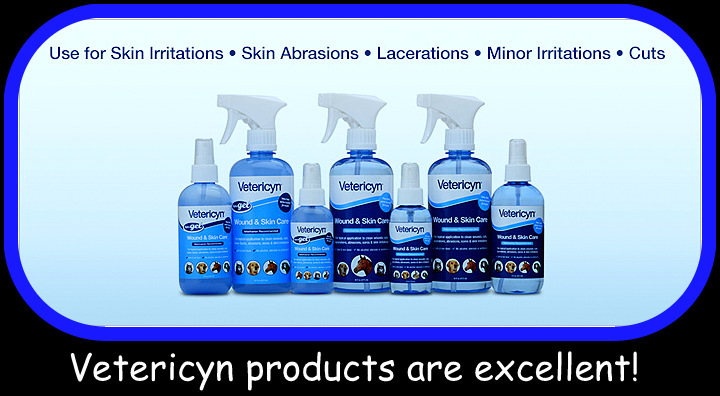 Vetericyn products are high quality, safe / easy to use, and may be purchased online and in pet supply stores. While they may cost more than other products, Vetericyn products have a long shelf life and are quite effective. After years of crate-training, this is the method that has worked beautifully for us. While I normally encourage folks to purchase deer/elk antlers for chew-bones, we sometimes use natural chew-bones for young puppies, especially if they're bigger than the puppy! Even when the crate is perfectly "stocked" with proper toys, food/water and dry papers, puppies still crave the attention of their humans and want to be free of the crate. If you allow a pup to get this upset, you can look for trouble, including upset tummy, depression & other issues. Read more in Chapter 12 to crate-train & house-train with ease! Abby LOVES to "speak" and is thrilled to show off her talents. Cindy has several versions of "speak" but she hates my camera, so you'll only hear a few of her voices in this video. Enjoy! 2) "BED" Abby & Cindy (actually, all 4 of our dogs) learned the "bed" command before any other obedience training upon entering our home. "Bed" is a simple, 1-syllable word that is easily taught by pointing to the dog's bed and repeating the command word until learned. Our dogs can be anywhere in the house and when we say "bed," they immediately report to their pillow-bed at our front door. All of our dogs love the water, but we don't "force" it on them - we allow them to investigate the water's edge for as long as they need to in order to be comfortable with it. http://www.youtube-nocookie.com/embed/RbdpfZeLnlA?rel=0 = probably my favorite video taken at our pond over the years... "Cindy" doesn't share very well. http://www.youtube-nocookie.com/embed/eqq-gdYsbyk?rel=0 = more pond fun, back in the day when I still had my bulldog program going. And, sometimes, HOME-MADE toys work just as well, especially for Fetch-training! http://www.youtube-nocookie.com/embed/XUvSYQyqrBY?rel=0 = "Ziva" still enjoys fetching, anything from a tennis ball to a "homemade" toy is just fine. 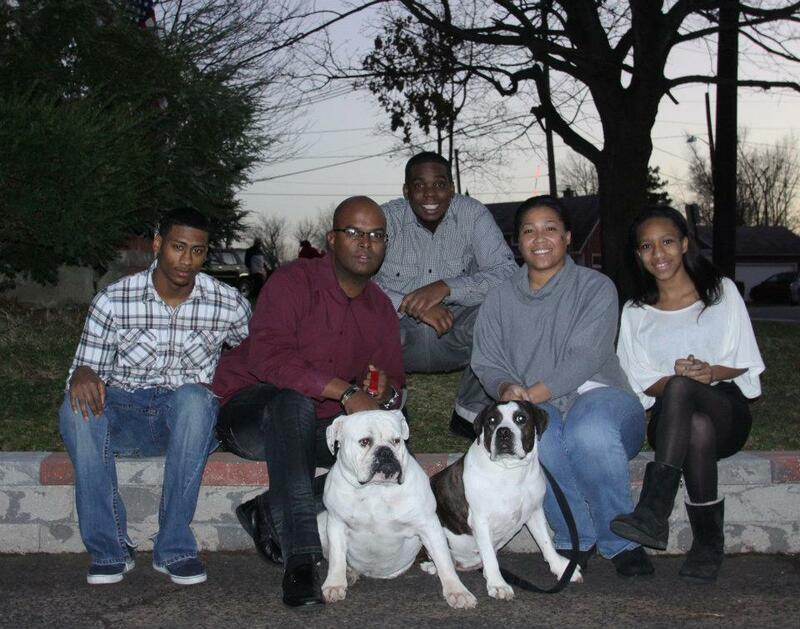 Many thanks to the Zeno Family of NJ for sharing this photo. Their household is a perfect example of ADULT DOG ADOPTION vs. the challenges of a small puppy. The Zeno's called to reserve my prize stud dog, "Clyde" (left in photo), 2 YEARS before I was willing to part with him. Meanwhile, I referred them to a breeder friend of mine, who let them adopt "Bonnie," (right) already spayed and ready for her forever home. Adopting these 2 adult dogs was the perfect fit for the Zeno's, as they are a busy household that required low-maintenance, ready-to-love pets. I still enjoy hearing from this family and am blessed to call them my FRIENDS! Mark Zeno was kind enough to create our DOG BLUFF group page on Facebook. Click here to join the fun! Matt & Amy (Maiden, NC) are proud parents of 4 beautiful children AND several fur-babies! They're our cousins, so I'm allowed to brag on them here! This family has adopted TWO of my adult retirees in the past, and most recently, they helped rescue a puppy from a litter I helped with. This family shows willingness to love any breed of dog, any AGE dog (they waited a LONG time for "Sherman" - reserved him as a puppy when I first got him for my Oldie program! ), and they love their dogs for LIFE. Well done!!! Chapters 1, 2, 5, 8, 10, 11, 12 and especially Chapter 15 of my book truly "speak" through the following story. Chapter 15 addresses the most difficult part of owning and loving a dog. I am honored to share the heartfelt sentiments of Olivia (Boiling Springs, SC), who wrote the following Facebook post on 11-6-17. 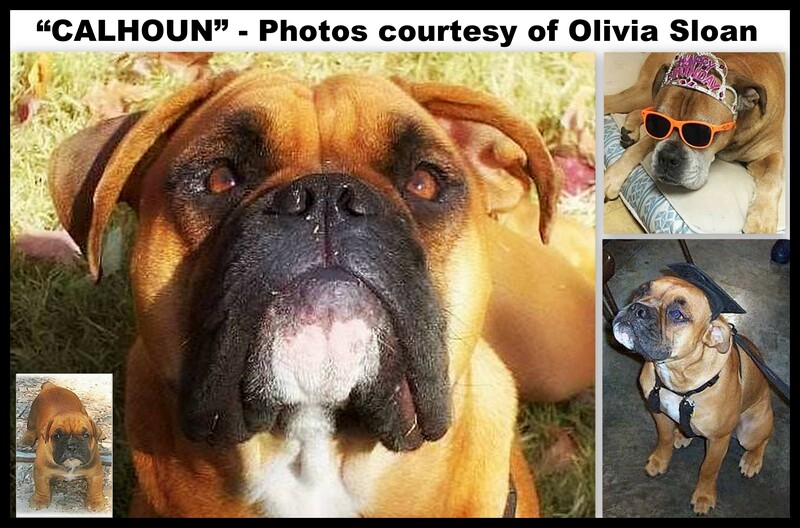 As of 2017, Olivia is Board President of "Vested Partners," a program utilizing therapy dogs for Autism. Olivia also enjoyed volunteering with "SC Therapy Dogs" at one time and worked to make Calhoun an effective part of that passion. This story covers SEVERAL things that I "preach" on - this is how to LOVE YOUR DOG!